In Developer Studio, the Set tool provides a graphical option for issuing the SET command. The setting lasts for a single procedure. Note: Not all parameters can be set using the Set tool. For a complete list of parameters, see SET Parameter Syntax. Right-click the procedure in the Procedures folder and choose Open from the menu. The Procedure Viewer opens. Click and hold a component connector (yellow diamond), then click the Set button on the Component Connector toolbox. The Set tool opens. See Set Dialog Box. Select the parameter to change, then click Add. The new parameter is added to the Used Settings list. Highlight the parameter by single-clicking it. Possible values appear in the Current Value list, and the current value is highlighted. Choose a value from the Current Value list. Enter a valid value in the box at the top. Lists available parameters. Use the left and right arrow buttons to scroll through the list of parameters. Lists parameters that have values assigned to them for this application. To move parameters within the list, select a parameter and use the To Top, Up, Down, and To Bottom buttons. Lists the possible values for the selected parameter in the Used Settings list. The current value is highlighted. Displays a description of the currently highlighted parameter. Adds a parameter from the Available Settings list to the Used Settings list. Removes a parameter from the Used setting list. Displays the SET command in code, and specifies any errors. 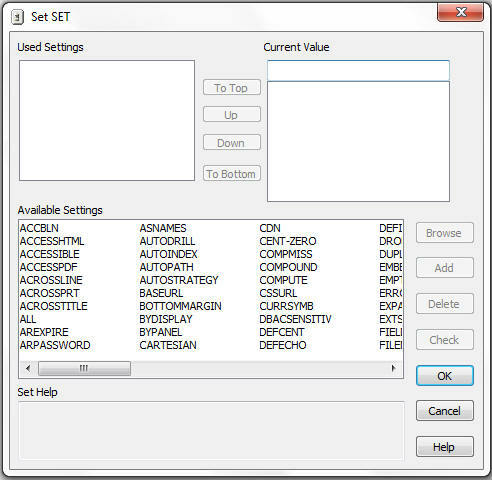 Closes the SET dialog box without saving the SET settings.